As days are getting longer, sunnier and warmer, the smell of Spring is in the air. And begins the season of Naeng-myeon! Originally a delicacy in northern Korea, Naeng-myeon became widely popular throughout Korea after the Korean War. Naeng-myeon in Korean means “cold noodles.” Thin noodles in this super delicious dish typically made of buckwheat or sweet potato starch and the dish is usually served with slices of cucumber, Asian pears, and steamed beef along with half of a boiled egg. There are 2 main variations of Naeng-myeon: Mul Naeng-myeon and Bibim Naeng-myeon — See them on our menu! 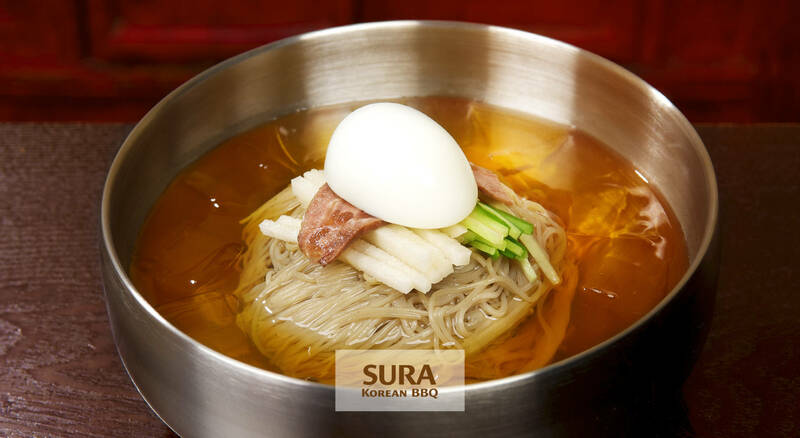 “Mul” being a common Korean prefix for “water,” as the name suggests, it features cold buckwheat noodles served in a tangy iced beef broth with cucumber, slices of Korean pear, and a slice of boiled egg. “Bibim” can be roughly translated to “mixed.” Bibim Naeng-myeon is a dish where you can enjoy cold buckwheat noodles with a red chili paste, cucumber, slices of Korean pear, and of course a slice of boiled egg that tops it off. You’ll find, as a matter of fact, Mul Naeng-myeon is the perfect way to cool off on a hot day. Not just because the tangy iced beef broth which contains slushy bits of ice (:D), but the dish is also modest size-wise and its content keeps you from feeling too stuffed. Another variation comes with the prefix “Hwae/Hoe,” which means raw fish or sashimi if you would. But more precisely it is a type of fermented baby stingrays from Korea’s west coast. Enjoying this Hwae Naeng-myeon, you’d be a fan of the clean and simple taste of the fish, paste and noodles. One thing for sure is they all are fantastic complements to Korean BBQ! Having a thought to try great Korean BBQ and Naeng-myeon? Come on down! SURA is proud to serve the most authentic version of the dishes using only the freshest & the finest ingredients available!